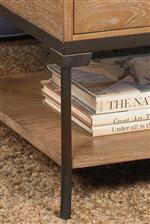 Add storage space and rustic industrial style to your living room with this chairside cabinet. The piece features a mix of metal and wood with a statuary bronze metal base and lightly distressed Aged Cappuccino finish over knotty ash veneers. One drawer and one door offer concealed storage space, while a magazine rack on the back promises smart function. The 2013 Chairside Cabinet with Bronze Metal Base by Null Furniture at Westrich Furniture & Appliances in the Delphos, Lima, Van Wert, Ottawa, and Celina area. Product availability may vary. Contact us for the most current availability on this product. Mixing bronze metal legs and hardware with rustic knotty alder veneers and a lightly distressed Aged Cappuccino finish, this collection of occasional tables highlights rustic industrial style. Shaped legs lend an elegant, feminine element to the strong industrial look, while the light finish keeps the look casual and warm. Designed to make the most of your space, pieces are smaller in scale and feature tons of storage. The 2013 collection is a great option if you are looking for Industrial Casual furniture in the Delphos, Lima, Van Wert, Ottawa, and Celina area. Browse other items in the 2013 collection from Westrich Furniture & Appliances in the Delphos, Lima, Van Wert, Ottawa, and Celina area.